We offer Chinese dance, wugong, and ballet classes that work together to create a well-rounded dancer that is prepared for the stage. 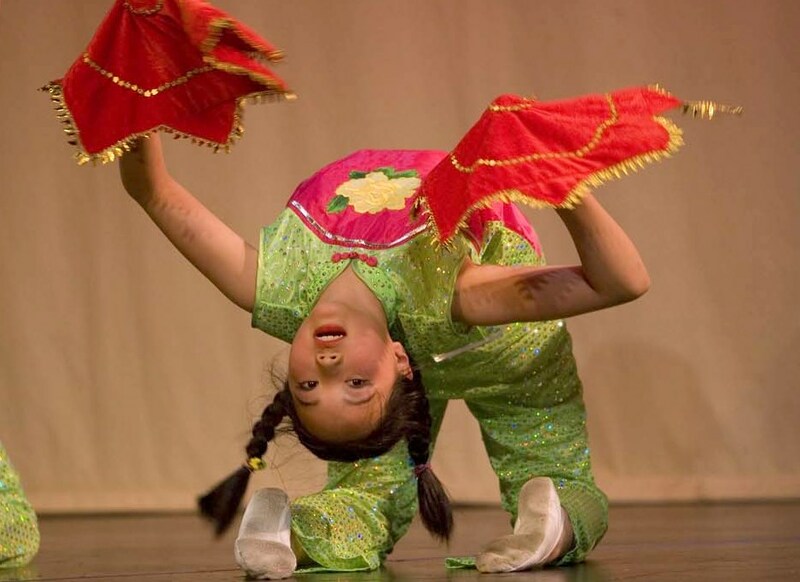 We offer Chinese dance classes of many different levels aimed for students of various ages from 4 year olds to adults. Each class begins with a Shen yun 身韵 warmup that teaches the fundamental movements and feel of Chinese dance. Classes continue by learning either a classical Chinese dance piece (古典舞) or a folk dance piece (民族民间舞). This year classes are learning: “Happy Chicken” Han dance, a Miao ethnicity dance, a Korean folk dance, an Indian dance, a modern Chinese fan dance, a Japanese dance, a dance from Xinjiang, and a classical Chinese dance. Check out the photos from past performances. Ah-lan rehearsing a dance of the Yi ethnicity. The wugong class taught by Ah-lan, is critical for development as a dancer. This is a children’s class and enrollment is by instructor invitation. This class focuses on increasing flexibility, strength and coordination. Cartwheels, front walkovers, turns and other advanced Chinese dance techniques are taught. Classes are on both Monday and Thursday nights. This is a mandatory class for the higher levels. In China, Chinese dancers are trained in basic ballet. We offer this same training to our dancers. Students learn and perfect barre work like tondue and center combinations that include chaine turns in the process improving their posture and learning to control their movements. Students who take the class improve greatly in their Chinese dance as well as their ballet. These classes are generally taught in combination with a Chinese dance class and are usually offered right before or after the Chinese dance class. Ballet classes are also offered for children and adults on a drop-in basis through our new Open Classes. Attendance: Students are expected to come to class on time and ready to dance. Parents of young dancers are welcome to watch class through floor to ceiling windows from our waiting area. If the student is unable to attend class please contact all instructors at-least a day prior to the class that will be missed. Due to the nature of performance preparation missing class has a negative impact on the student and on other students in the class. Attire: Students should wear dance shoes (ballet slippers are advised), and a leotard and tights. Hair should be pulled away from the face into a bun(even chin length hair gets in the dancers eyes and distracts the dancer when turning and practicing other dance moves). Performances: If you or your child does not want to or can not participate in a performance, please inform Ah-lan at the beginning of the year. Otherwise every dancer is included in the choreography and is expected to perform. Performance dates are announced well in advance.